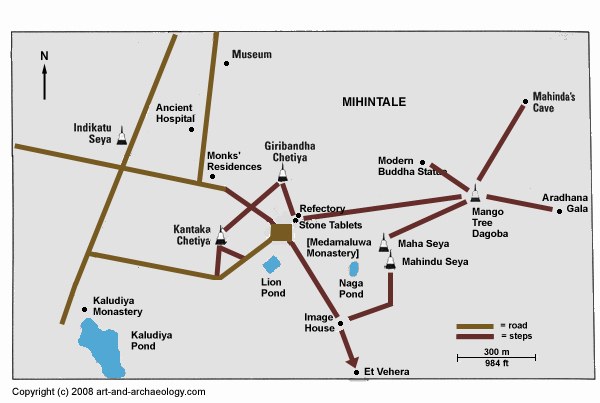 Located about 12 km east of Anuradhapura, Mihintale - "Mahinda's Hill" - is the place where King Devanampiya Tissa (247-207 BC) was converted to Buddhism by Mahinda, a son of the Indian Emperor Ashoka Maurya. Memorials of Tissa's conversion are scattered around the eastern hilltop. They include the spot where Mahinda and Tissa had their first meeting (Mango Tree Dagoba), the location of Mahinda's first sermon (Aradhana Gala), the cave where Mahinda lived, and stupas honoring the Buddha (Maha Seya) and Mahinda (Mahindu Seya). Downhill and to the west are two later (10th century AD) forest monasteries, Kaludiya and Medamaluwa.